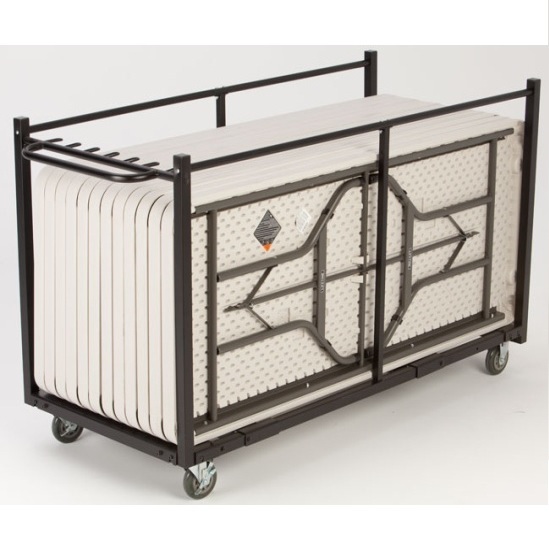 Lifetime Table Cart - 80193 Folding Table Storage Truck. Do you have Lifetime tables, round or rectangular? Need a cart to store and transport them? The 80193 provides you an optimal solution for your storage and transportation needs. This table cart can hold up to 14 rectangular tables or 8 round tables made by Lifetime Products. And yes, this cart will store your Lifetime 72 inch round tables. 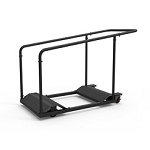 Made with 16 gauge powder-coated steel, this cart is plenty sturdy to support the weight of all Lifetime tables at full capacity, some 700+ lbs. 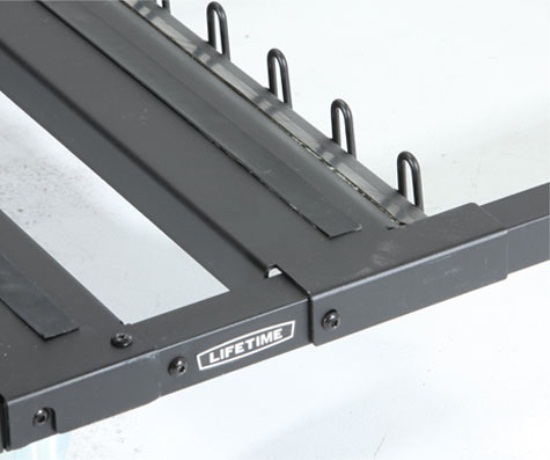 Lifetime Products warranties this product for 2 years. 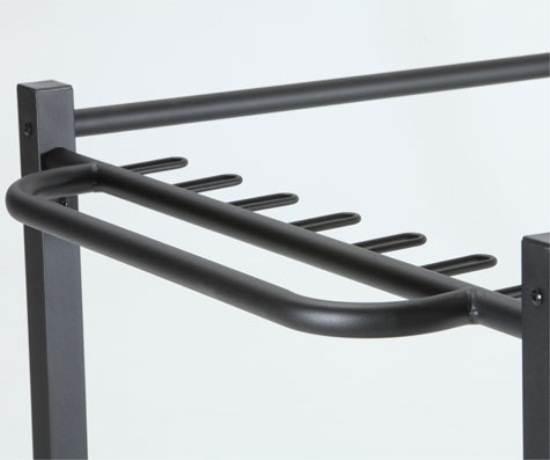 Material of construction: 16 gauge powder-coated steel. Storage capacity: 8 Lifetime round tables, 12 Lifetime rectangular tables, or 14 Lifetime seminar tables. Comes with a 2 year warranty from Lifetime Products. 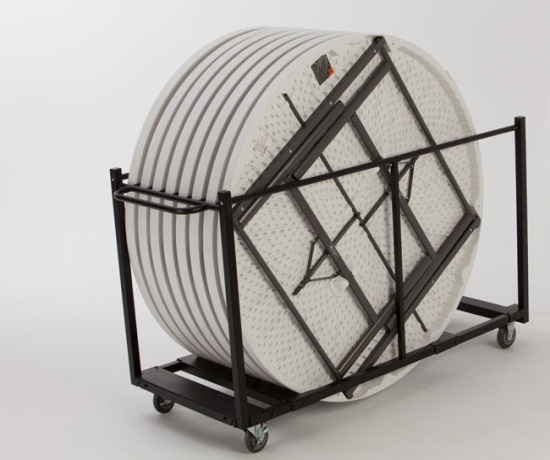 This table storage cart can store and transport Lifetime's 72 inch round tables. The cart has a rubber surfacing to help prevent folding tables from slipping. Steel handlebar helps you drive the cart easier. 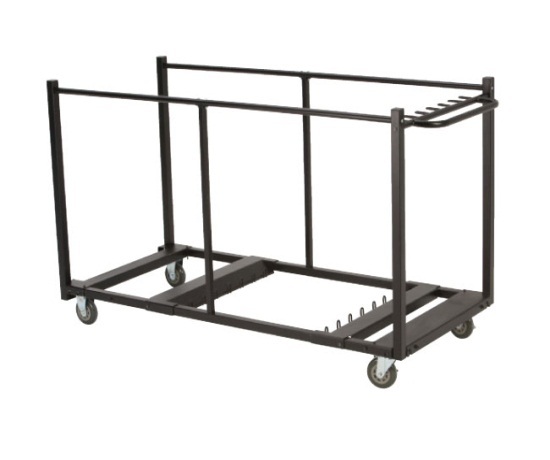 Cart assembled dimensions: 76 inches L x 31.4 inches W x 43.1 inches H.
Product ships via FedEx and generally arrives within 10 business days. The cart actually came UPS within a few days and several before the tables we ordered were delivered by freight so you will wan to keep you eyes open for a UPS delivery. Box is just over 6' long and weighs about 80 lbs. Assembly is not too bad-I've seen worse but it is a little tricky so read and follow the directions. Cart accommodates several 6' tables at a time and they are easy to roll on and off the cart for set up and tear down. The cart actually came FEDEX within a few days. Box is just over 6' long and weighs about 80 lbs. Assembly is not too bad. Cart accommodates eight 72" tables at a time and they are easy to roll on and off the cart for set up and tear down. Q: Will this rack hold 8 old Lifetime tables that are 10 years old? Q: What is the Tubing Gauge of the metal frame? A: The Tubing is 16-Gauge. Q: Do, all four wheels swivel so the cart can be easily maneuvered around very tight corners into a small storage closet? A: The front two are locked into place while the two back by the handle are 360° swivel. 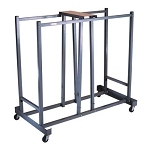 Fast Shipping: Orders for the 80193 Lifetime Heavy-Duty Table Cart generally leave the warehouse the next business day. Dimensions: 77" x 13" x 8"